Colombians will choose between right-wing Ivan Duque and leftist Gustavo Petro in today’s runoff election for the presidency. Duque emerged from the May 27 first round with 14 percentage points over Petro. 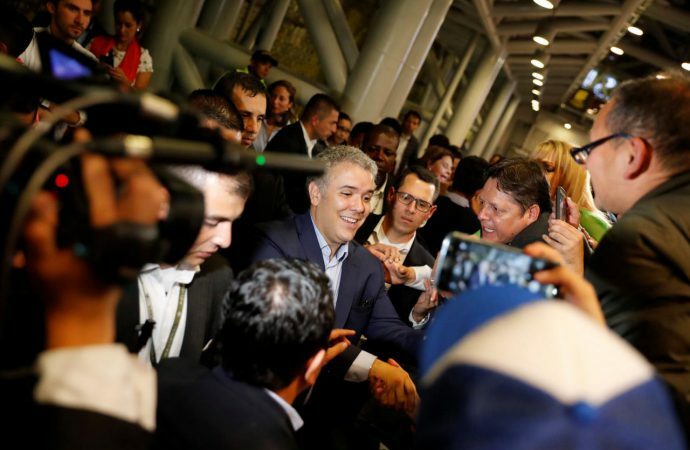 The 41-year-old supported by former Colombian president Alvaro Uribe leads a campaign largely based on opposition to the 2016 peace deal with the Marxist FARC rebels who have created the Revolutionary Alternative Common Force party. Opinion polls suggest he will win, but Petro is likely to gain a seat in the Senate to push against Duque’s conservatism with his campaign of anti-corruption, common-sense economic reform and a shift to clean energy. Either presidential candidate will be assuming a demanding leadership position that could rattle prospects of domestic and regional stability. On the home front, they must confront a growing cocaine trade and the National Liberation Army guerrilla movement. Venezuela’s turmoil next door exacerbate fears of a spillover of the dictatorship. A recent bee attack at a Duque rally suggests neither candidate will be largely welcomed. A peaceful transition of power, however, could serve as a model for Latin American elections to come, such as Mexico and Brazil later this year.